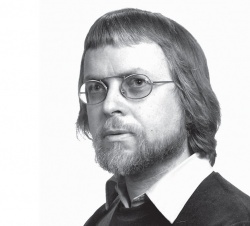 Kåre Kolberg (1936) is one of Norway's foremost contemporary composers and is regarded as one of the pioneers of early electronic music and multi-disciplinarity art in Scandinavia. He has composed music for film, theatre and chamber orchestras to jazz acts such as Svein Finnerud Trio and Jan Garbarek. Kolberg studied organ at the Music Conservatory in Oslo and has an MA in musicology from the University of Oslo. In addition to his career as a composer, he has been active as an organist for many years. First as a research fellow, and later as a critic and writer, Kolberg has been especially concerned with the role and function of contemporary music in society. He has also held a number of important honorary posts in Norwegian music life. From 1970-73 he served as president of the Norwegian Section of the ISCM - Ny Musikk, and from 1979-85, he was president of the Norwegian Society of Composers. The latter of these two periods coincided with the first years of the Norwegian Music Information Centre's existence. Kåre Kolberg was one of the first composers to deal with the public's attitude towards modern music. The "neo-friendly" elements in his otherwise fairly modernistic musical language can be regarded as an indication of his desire to communicate more directly with his audience. Kolberg's music has always been characterized by contrasts. Not only does he employ dynamic contrasts, but also contrasts of sound and rhythmic and melodic contrasts in which, e.g. lyrical, melodic passages are juxtaposed with blocks of sound. However, perhaps the most characteristic feature of Kolberg's music is his juxtaposition of material from different genres. Modernism contrasted with elements from jazz or popular music, and elements from the romantic genre with idioms from contemporary music. These contrasts lend his music great expressive force and are a source of considerable musical humour - which is another typical feature of Kolberg's music. A great many of his compositions reveal subtle humour, such as The Emperor's New Tie (1973) and For the Time Being (1984). The latter work was, incidentally, selected by the Norwegian Society of Composers as Work of the Year the same year it was composed. (Source). VA, Popofoni, Sonet ‎(SLP 1421/22), 1973. Contains tracks by Gunnar Sønstevold, Nordheim, Alfred Janson, Kåre Kolberg, and Terje Rypdal. "Holy grail of Norwegian free-jazz and electronic music." . Reissued by Prisma Records ‎(PRISMALP001), 2-LP, 2012, , . Kåre Kolberg, Electronic Works 1970-1973, Prisma Records (PRISMALP002), LP, 2012. Contains three works: Nova, 1972 (composed for a multimedia installation), Omgivelser, 1970, Keiserens Nye Slips [The Emperor's New Tie], 1973 (this piece composed and recorded in 1973 at Electronic Music Studios in Stockholm, using a PDP 15/40 computer; it was programmed in the EMS-1 computer language developed in the same studio; it was commissioned by Fylkingen, Stockholm; the recording previously appeared on a 1980 compilation by Philips and Kolberg's 1988 compilation by Aurora). , . Kolberg's biography at Ballade.no, 2002.